Chibitronics is the perfect product to combine craft and electronics by using circuit stickers. This is just the kind of product I get excited about because it lends itself to artistic creativity once you get your head around the science of how electronics work. The Chibitronics STEM Starter kit comes with a brilliant little spiral bound booklet, which teaches you step-by-step how electrical circuits work. We take a closer look at what is included in the box, and share our own creative project below. 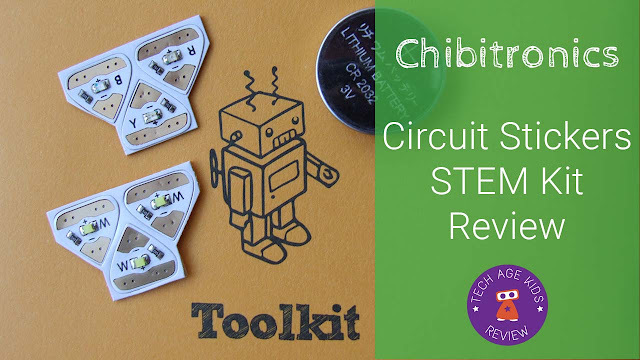 Disclosure: Chibitronics kindly sent us a Chibi Lights LED Circuit Stickers STEM Starter Kit to review. As always, our opinions are our own. The box is sturdy enough that you can pop everything back into it and put it away to use another day. Alternatively you can turn the box into a project. We've chosen not to hack our box and keep it for storage. Chibi Lights LED Circuit Stickers STEM Starter Kit is recommended for ages 13 plus, however my 8 year old really enjoyed using it with me. It is important to note that there are not enough supplies (LED circuit stickers) in the kit to complete all the projects plus make your own designs. The LED circuit stickers, like any other sticker, are one use only. In some cases we managed to peel off the LED circuit sticker and use on the next activity, but it looses its connectivity. You can however reuse the mini LED circuits by peeling off the conductive adhesive completely and then sew or solder the LEDs into another project. You can buy additional circuit stickers separately - like the fun tropical circuit stickers which includes pink, green and orange LEDs. The copper tape works really well, but make sure you measure the piece you need and cut it BEFORE you take off the backing paper. It is really sticky and once you've stuck it down, it will rip your paper to adjust the position. The copper tape needs to be done carefully to avoid too many creases and breaks in the line. If you're using Chibitronics with younger children, we'd recommend the adult to stick the tape. We also found we needed to rub the LED stickers down firmly (use the rubber end of a pencil) to ensure a good connection. Another safety tip is keep the clear packaging from the kit, so you can keep your coin cell battery separated from the copper tape and metal binders. The best way for most kids to learn, is by doing! 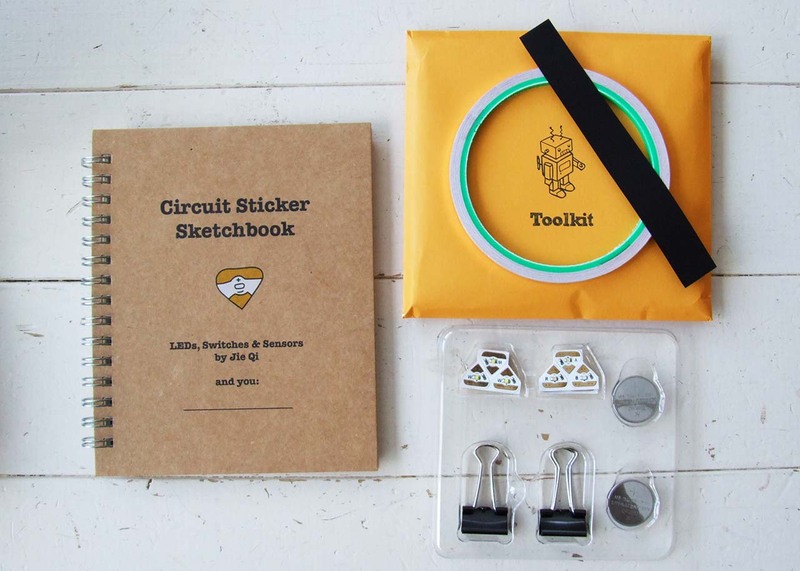 The STEM Starter Kit, encourages you to read, learn and then make your own circuit. I liked how the sketchbook guides you from basic single LED circuits to more complex circuits with switches. The sketchbook is clear and easy to understand for someone with no experience. It would make a great resource in a classroom or at home to help learn about electrical circuits in a fun and creative way. My 5 year old drew a starry night picture with a space rocket in the sketchbook. We used the parallel circuits template to add "real" sparkling stars to his picture. Once we completed a few templates in the book, my 8 year old was keen to add some lights to a cardboard rocket he made earlier. We needed a new solution to add the LED lights to the cardboard rocket. With the Chibi Lights LED Circuits Starter Kit they recommend binder clips to hold the battery in place between two sheets of paper. Our problem was, we had a 3D shape and the binder clip would just not work to hold the battery. My son, came up with the idea to use a battery holder we used for a previous project (Cross Stitch and Parallel Circuits). We secured the battery holder with some double sided tape and then used the copper tape to create two parallel lines. Make sure the parallel lines are the right distance apart for the LED circuit stickers to make good connections. We added 3 LED circuits stickers to every portal window on the rocket. The boys loved their creation.